We live in a fast­-paced world where our attention is constantly divided. Performing multiple tasks at once is commonplace, and there certainly aren’t enough hours in the day to do everything we’d like to do. Online experiences are no different, especially when it comes to video. When you watch a video on the web, you often need to work on other things at the same time. 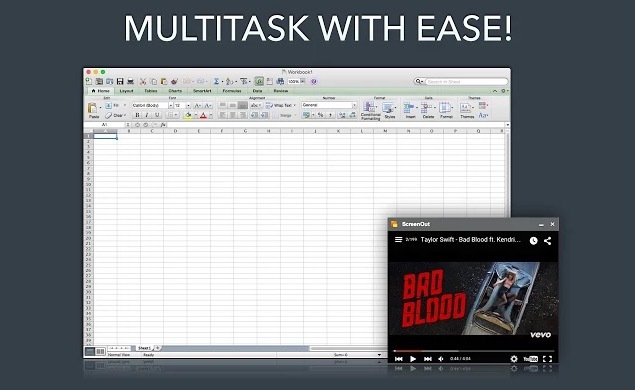 Maybe you want to stream the latest episode of Orange is the New Black on Netflix while you crunch numbers in Excel. Or perhaps you’d like to watch a Photoshop tutorial on YouTube while doing the steps in real­time. If you’re a music fan, you might want to control a YouTube playlist while writing an essay in Microsoft Word. And if you’re into video games, you could enjoy following along with Twitch videos while sorting through email. These are all situations that require you to divide, not only your attention, but also your screen to accommodate the video you’re playing in addition to the primary task at hand. Doing so requires you to keep the tab with the video open, then resize your windows to fit everything in your line of vision without interrupting video playback. It’s like playing a game of Tetris, only minus the fun. ScreenOut, developed by Pinch of Awesome, eliminates that whole process, which is why it’s one of the more awesome Chrome extensions on the market. Instead of resizing your browser window to make room on your screen for the other programs you’re using, you can pop out your video into its own moveable, resizable window. Position the video viewer anywhere you’d like, and control playback all in one place. Play, pause, full­-screen, volume, and other settings are all accessible from the popped­-out viewer, and the original page containing the video doesn’t need to stay open. You’re free to browse the web or close the tab entirely without interrupting playback, which is nice, especially for anyone who tends to keep a bunch of tabs open at once (which, not only takes up space in your browser window, but can also slow down your computer). If you want to dock the video player on top of your other windows, you can enable panels on your Chrome Flags page, which only takes a few seconds. Just copy and paste chrome://flags/#enable­panels into the Chrome address bar, press enter, and click the “enable” link under “Enable Panels”. Restart Chome and, voilà! Your popped­out videos will now stay on top of your other windows so you can switch from window to window while your video stays docked in the foreground. ScreenOut comes with some other pretty cool features, too. Those annoying video ads before and during your YouTube videos are disabled. 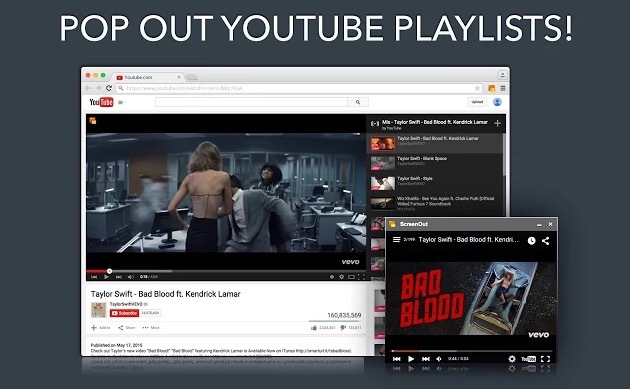 You can also pop out YouTube playlists. And because ScreenOut supports YouTube, Twitch, Vimeo, Netflix, and most other web video sources, video buffs will get plenty of use out of it. It’s truly one of the best video extensions for Chrome, especially for multi­taskers. Plus, it’s totally free to use. Forever. Installation is quick and easy. Just download ScreenOut for free from the Chrome Web Store, and you can start using it right off the bat. Once the extension is installed, you’ll see the ScreenOut icon next to the address bar in your browser, which you can click to pop out the first video on your screen. Alternately, you can click the ScreenOut icon that appears in the top­left corner of the video you’re watching. If you’re looking for video extensions for Chrome, YouTube extensions, or tools to help you multi­task on the web, ScreenOut is one of the best Chrome extensions you’ll find. Head over to the Chrome Web Store to download ScreenOut for free, and say goodbye to those frustrating online video experiences you’ve come to accept. Previous: What is All of this Talk about CRM, Social CRM, and CXM? The Top 10 Mozilla Firefox Add-ons, May 2010.